Colleges and universities with programs in industrial design and related design disciplines provide rich environments for students to organize around their career aspiration through IDSA Student Chapters. This type of organization allows for leadership development through student officers who are elected by their peers. The chapters have recognition from IDSA and are authorized to use the name and abbreviation in their fulfilment of the mission of IDSA and of the chapters. IDSA Student Chapters enjoy the benefits of using the IDSA identity and are eligible to participate in the Society's annual Student Merit Award (SMA) competition. 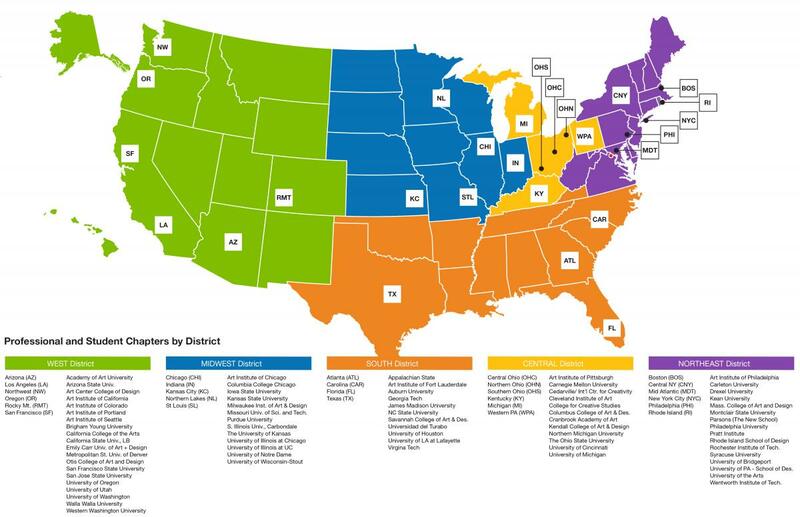 In addition, student chapters have an automatic connection to the profession chapters closest to them as both are collectively grouped under the respective IDSA Districts. This structure is exceptionally important when the SMA competition advances from the school to the District level. Currently, there are about 60 schools in North America with undergraduate and/or graduate degree programs in industrial design and related design disciplines and most of them have IDSA Student Chapters. For more information, please visit IDSA's ID Schools list. If you would like to connect with your IDSA Student Chapter or are interested in creating one at your school, please write to us at membership@idsa.org or call us at 703.707.6000 x103.